This December, Oxford University Press will publish Toward an Islamic Enlightenment: The Gülen Movement by Hakan Yavuz (University of Utah). The publisher’s description follows. M. Hakan Yavuz offers an insightful and wide-ranging study of the Gulen Movement, one of the most imaginative developments in contemporary Islam. Founded in Turkey by the Muslim thinker Fethullah Gulen, the Gulen Movement aims to disseminate a ”moderate” interpretation of Islam through faith-based education. Its activities have fundamentally altered religious and political discourse in Turkey in recent decades, and its schools and other institutions have been established throughout Central Asia and the Balkans, as well as western Europe and North America. Consequently, its goals and modus operandi have come under increasing scrutiny around the world. Yavuz introduces readers to the movement, its leader, its philosophies, and its practical applications. After recounting Gulen’s personal history, he analyzes Gulen’s theological outlook, the structure of the movement, its educational premise and promise, its financial structure, and its contributions (particularly to debates in the Turkish public sphere), its scientific outlook, and its role in interfaith dialogue. 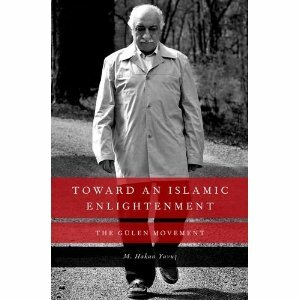 Towards an Islamic Enlightenment shows the many facets of the movement, arguing that it is marked by an identity paradox: despite its tremendous contribution to the introduction of a moderate, peaceful, and modern Islamic outlook-so different from the Iranian or Saudi forms of radical and political Islam-the Gulen Movement is at once liberal and communitarian, provoking both hope and fear in its works and influence.